What if a reporter got inside the production of a major motion picture? One with big movie stars, 4,000 extras and a "new-Hollywood" budget. Watched every day, interviewed crew, and stitched it all together. Below the Line: Anatomy of a Successful Movie is a nonfiction narrative about how major motion pictures are made today using one movie as a vehicle. As the book follows the people making Last Vegas, it stops along the way to explain process and different aspects of the business, from creating sets to costuming. The movie stars are well known -- Robert De Niro, Michael Douglas, Morgan Freeman, Kevin Kline and Mary Steenburgen - but in this book they play supporting roles. Instead, the leads are the people behind the camera, the director (Jon The Meg Turteltaub) and a huge cast of artists and artisans, designers and creators, overseers, office and logistical support, editors and musicians. Below the Line proves movies are a collaborative art form. Hit the arrows to see more about BTL! Film sets are an otherworldly space, particularly big-budget Hollywood productions. A small army of people work toward the common goal of getting the movie on the big screen, but how does that ecosystem actually run? That’s the question at the center of journalist Meredith Jordan’s book, Below the Line: Anatomy of a Successful Movie. Today on The Neil Haley Show, The Total Tutor Neil Haley and Caregiver Dave will interview Meredith Jordan, Author Below the Line: Anatomy of a Successful Movie. Below the Line is a must-read for anyone interested in the movie-making process, from casual movie lovers to serious students of film. Sure, there are A-listers and celebrity sightings, but this book focuses on the unsung heroes of Hollywood and gives film fans a one-of-a-kind look at the anatomy of a movie. 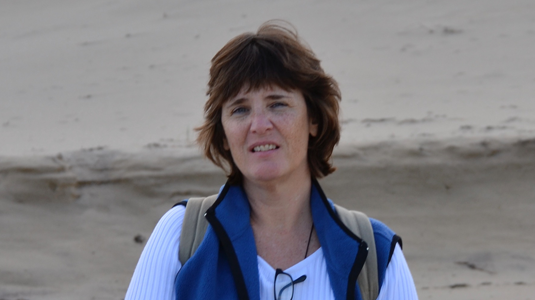 Meredith Jordan is an award-winning journalist who worked for East Coast news organizations for 25 years, including Dow Jones & Co., Cox communications and National Geographic. 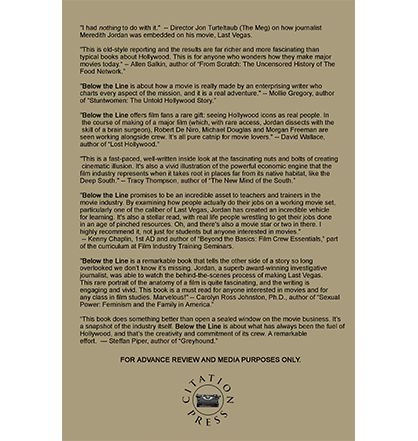 “Below The Line” is a new narrative nonfiction book by a journalist who was embedded with a major film studio while it was filming “Last Vegas” in Atlanta. The book goes in depth and behind-the-scenes to describe the many types of work accomplished off-camera. A great read for anyone who aspires to work in movie production. Meredith Jordan is interviewd on The Maureen Langan Show. Steven Spielberg recently voiced his opinion about Netflix movies deserving Oscars. 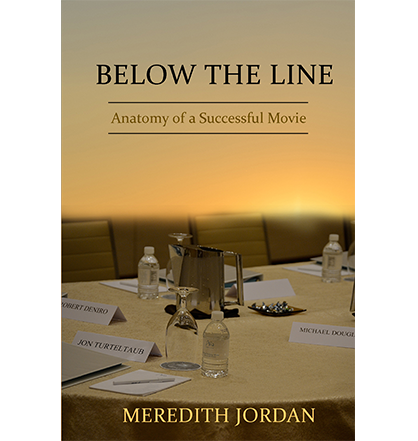 Meredith Jordan, journalist and author of Below The Line: Anatomy of a Successful Movie, discusses streaming services and explains what the issues are. 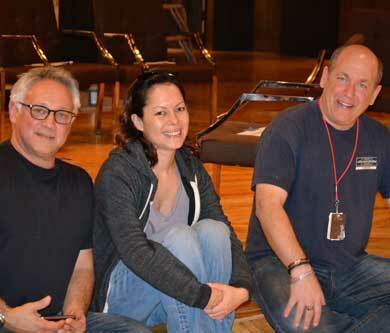 Movie stars are nice but it’s the crew that makes the movie. Click the red arrows to see more pages. — Billy Badalato, unit production manager, Last Vegas. Last Vegas featured some of the best known and loved actors alive: Robert De Niro, Michael Douglas, Morgan Freeman, Kevin Kline and Mary Steenburgen. Every one of them had earned an Academy Award, De Niro and Douglas, two. By the end of principal photograph it had feature a cast of 50, 4,000 extras and a crew of 360. With its modest $30 million budget -- $36 million before tax credits -- it quietly grossed more than $134 million at the box office and another $16 million in aftermarkets. Last Vegas fits into a large pack of 2013 movies. As the 56th largest-grossing movie of 687 releases in the U.S. it might fall from view with giants like Hunger Games: Catching Fire, Iron Man 3 and Frozen. Yet with its $30 million budget it’s far more typical of how a successful movie is made today. Producers spent years planning it, got a solid director and signed big-draw actors. They came up with product placement to cut location costs in Vegas among many other things. They shot the movie in Georgia, which provides compelling tax credits to lure movie productions. They hired management, which hired crew, everyone paid scale to keep costs down. The script had continued to change a little throughout the entire process. To keep everyone on the same page, each revision resulted in a change to the color of the script. These weren’t things that would alter the plot but they were noticeable. The rap star cameo, which featured Kanye West in early versions, was rewritten for 50 Cent. The El Cortez Hotel & Casino, originally envisioned as home to the scenes in a B-Grade hotel, was replaced with Binion’s Gambling Hall and Hotel. The wet t-shirt contest became a more ratings-friendly bathing suit challenge. Characters from Blue Man Group were out and some from Cirque du Soleil’s Zarkana were in. The reasons varied, star schedules to a simple decline on the part of the El Cortez, but each shift had a ripple effect. Virtually everyone in a leadership position analyzes the script for production elements that relate to their jobs, so they all break it down differently. The unit production manager read it for dollar signs. The production designer saw the "look" of the movie and each scene in sets. The set decorator would see each set furnished. The costume department managers looked at it for what the actors would wear, keeping script days in mind. The props department would see objects the actors touched. Locations saw it in scenes to be shot outside the studio. Grips would read it for rigging, electric for cable and power distribution, and camera for lenses, all of them at the direction of the cinematographer. But in the end, they would work from Rake's breakdown, which created the schedule. He would run the show with Turteltaub, who had read the script with a vision that steadily evolved. 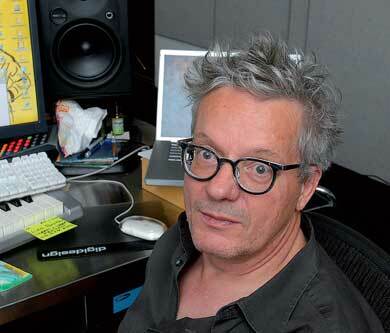 The “Boom Boom Room” was unlike any other place in the studio offices. It was the art department’s conference room. Each wall, painted black and then affixed with fiberboard just a week before, now had hundreds of images. Places where different scenes took place were labeled. The city of Las Vegas took up a lot of the space with subdivided areas like “Aria” and “Old Vegas” and “McCarran Airport” and “X-Scream.” The latter was a ride atop the Stratosphere where they would send Michael Douglas and Mary Steenburgen – or stunt people – careening over the side. There was also “Flatbush, NY, 1955,” and each town where a main character lived. It was all the handiwork of David Bomba, production designer. It was Last Vegas coming to life with the practical purpose of giving the director visuals to choose from. It was just one way Bomba ensured he and Turteltaub were in the same frame. 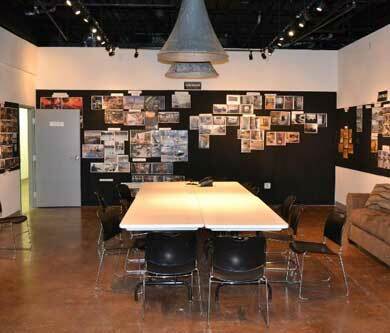 Tension around the studio in Atlanta had steadily built during prep. Most department heads and managers were concerned their respective budgets were too tight given the caliber of the cast and the expectations for the movie. It was up to them to make the movie good and they felt strapped. There was intense lip service paid to the bottom line by production management, yet they could see big money flowing. 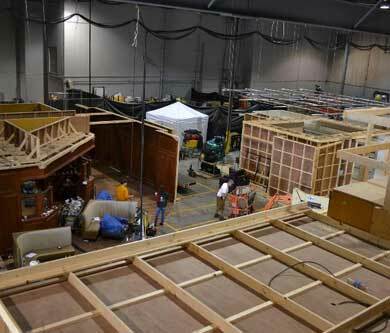 The penthouse set being built on the soundstages would cost more than $600,000. 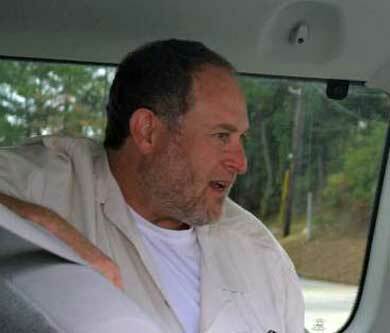 Turteltaub wanted more extras and now 4,000 were budgeted. “Four thousand extras isn’t a small movie,” lamented one. 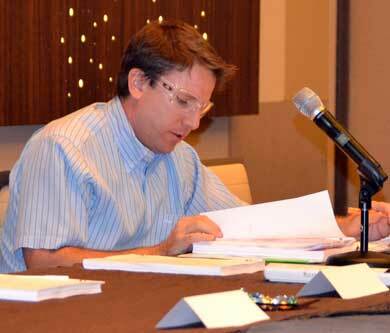 The pressure finally burst through at a work dinner in Las Vegas where the creative team had gone to scout locations. With cameras and cranes and monitors in full sight in the lobby it was clear they were shooting something serious. Word of who was in the cast spread. Every so often an Aria guest, tipped off De Niro was there, took the 25 steps from the pedestrian flow onto the casino floor for a look. One man, wearing an expensive, tailored suit, laughed when he was asked if he was trying to get a glimpse of the movie stars. He admitted it. He said he didn't have a lot of time and wouldn't go too far out of his way, but if it was easy? He'd like to be able to say he'd seen De Niro. "This book does something better than open a sealed window on the movie business. It's a snapshot of the industry itself. Below the Line is about what has always been the fuel of Hollywood, and that's the creativity and commitment of its crew. A remarkable effort." "Meredith Jordan’s Below the Line offers film fans a rare gift: seeing Hollywood icons as real people. In the course of the making of a major film (which, with rare access, Jordan dissects with the skill of a brain surgeon), Robert De Niro, Morgan Freeman, and others are revealed as they've rarely been seen before, going about their workdays and interacting with the rest of the cast and crew, all the time unaware that they are being observed without a production company's or a publicist’s restrictions and image spin. It’s all pure catnip for movie lovers." "Below the Line is about how a movie is really made by an enterprising writer who hung out with the cast and crew of Last Vegas for months. She charts every aspect of the mission, and it is a real adventure." "Jordan undertook a huge effort with Below the Line, from getting embedded on a movie to begin with, to interviewing nearly everyone involved behind the scenes. This is old-style reporting and the results are far richer and more fascinating than typical books about Hollywood: She has the details you never see: about the budget, actor salaries and perk packages. This book is for anyone who wonders how they make major movies today." "If you have ever puzzled over what exactly a "best boy" is in the credits of a big-budget movie, if you've ever wanted to look under the hood and see how a movie actually gets made, this is the book for you. It's a fast-paced, well-written inside look at the fascinating nuts and bolts of creating cinematic illusion. It's also a vivid illustration of the powerful economic engine that the film industry represents when it takes root in places far from its native habitat, like the Deep South – as well as its potential social and cultural impact." "Below the Line promises to be an incredible asset to teachers and trainers in the movie industry. By examining how people actually do their jobs on a working movie set, particularly one of the caliber of Last Vegas, Jordan has created an incredible vehicle for learning. It's also a stellar read, with real life people wrestling to get their jobs done in an age of pinched resources. Oh, and there's also a movie star or two in there. I highly recommend it, not just for students but anyone interested in movies." "Below the Line is a remarkable book that tells the other side of a story so long overlooked we don’t know it’s missing. Jordan, a superb award-winning investigative journalist, was able to watch the entire process of making Last Vegas. With imagination she chronicles the path from an empty warehouse in Atlanta to the last scene, this time with the lens on the crew as well as the famous actors in front of the camera. This rare portrait of the anatomy of a film is quite fascinating, and the writing is engaging and vivid. This book is a must read for anyone interested in movies and for any class in film studies. Marvelous!" Meredith Jordan is an award-winning journalist who worked for East Coast news organizations for 25 years, including Dow Jones & Co., Cox Communications and National Geographic. She's also worked for smaller news organizations and believes that all journalism is fundamental to the wellbeing of democracy.